Refer your friends to 2 Girls and a Mop natural cleaning service and receive $25.00 off your next clean! Why should you choose 2 Girls and a Mop? 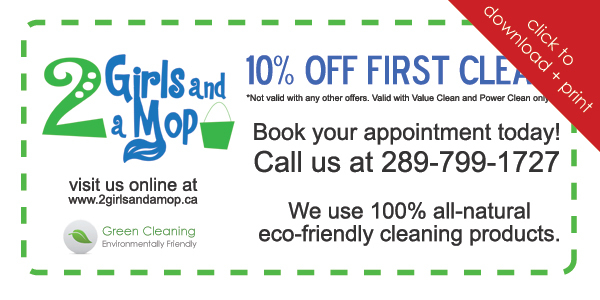 Our rates are based on 1 cleaner per hour. However, we may send up to 4 cleaners at one time. - A team of 2 people cleaning your home for 1 hour is equal to 2 person-hours. - A team of 4 people cleaning your home is equal to 4 person-hours. The cleaning time begins when the actual cleaning begins! lt ends after they have completed the appropriate amount of hours. Yes, we treat our client’s right! We have several payment options. You may pay with credit card, cheque or cash. *Cheques are honored after a client has been established – 4 cleaning sessions. You will be charged after the completion of the clean. An invoice and cleaning checklist will be provided after the clean has been completed. ...and surrounding areas upon request. For same day service please call before 10:00 am. Home cleaning in the 289 area code featuring our "green clean" residential house cleaning, maid service using all-natural eco-friendly cleaning products. Burlington, Hamilton, Dundas, Oakville, Waterdown, Ancaster, Flambourgh and Mississauga.